After months of renovation, the highly anticipated new Dolby Cinema at AMC Loews Lincoln Square 13 will finally open tomorrow with evening shows of A Star Is Born. The iconic Upper West Side theater is known for the world’s largest IMAX screen which was renovated to an IMAX Laser just in 2016. However, the remaining 11 auditoriums still have not upgraded to stadium seating or recliner seats from when they first opened back in 1992. The new Dolby auditorium will come with Dolby recliners as well as the enhanced audio and sound exhibition the premium format provides. It will replace the former Loews auditorium, which was known for its balcony. According to Fandango’s seat layout, the balcony remains in the new Dolby auditorium. 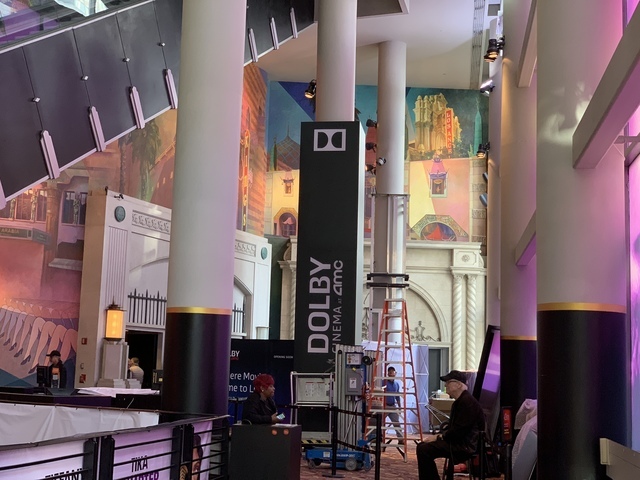 This marks AMC’s fourth Dolby installation in New York City. Previously, the AMC Empire 25 in Times Square, AMC Loews 34th St 13 in Midtown and AMC Magic Johnson Harlem 9 had received the premium format. Earlier this year AMC celebrated it’s 100th Dolby location. The first Dolby Cinema show at the AMC Loews Lincoln Square 13 will be a 7PM presentation of A Star Is Born tomorrow, on October 23rd. Left: Dolby construction on June 26th. Right: Dolby construction on October 16th. Can you imagine how people you can reach when you are getting outside your circle of influence?